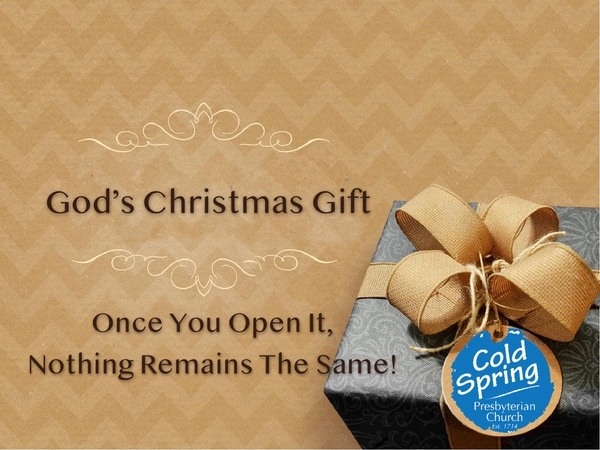 Once you open Christmas, God’s Gift, nothing remains the same. “The Word became flesh and blood, and moved into the neighborhood. We saw the glory with our own eyes, the one-of-a-kind glory, like Father, like Son. Generous inside and out, true from start to finish(John 1:14). Every day of the year is special. To someone. Yourbirthday is special, for example! In fact, every single day of the year has been co-opted to celebrate or commemorate one thing or another. Did you know that January is “National Bath Safety Month” and “Penguin Awareness Day” is January 20? The list is endless! Among thousands of personal, regional, national, and religious special days, Christmas, December 25, is unique. It’s the day we have chosen to especially celebrate God’s Gift when long ago, “The Word became flesh and blood, and moved into the neighborhood”(John 1:14). What a day! No doubt your memories of Christmas’ past are expressed through today’s traditions and customs. They help you unpack Christmas’ meaning. Seasonal food favorites. Special ornaments and events. Christmas movies and holiday music. Gatherings and gift-exchanges. Christmas Eve candlelight worship. The traditions go on and on. Sometimes the pastfamiliar traditions can overwhelm us as we miss loved ones, reminisce about by-gone days, or just feel a bit lonely during Christmas. Now is a great time to remember that from that First Noel, Christmas was always about the futureinvading our present. Those former memories may be little more than nostalgic, but the real gift of Christmas is anything but! All things can become new…again. 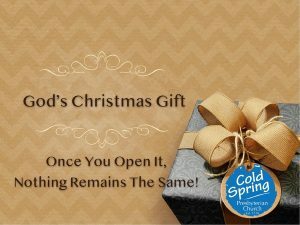 Once you open Christmas, God’s Gift, nothing remains the same. We can incorporate and build upon Christmas memories when we invest time to learn and grow. We can create new memories, making this Christmas, and every Christmas to come, vitally different, better. Can you imagine a thriving Christmas, not merely surviving it?! This year, let’s take all the best of Christmas’ pastand open our arms and spirits to new ways to receive God’s gift of Christmas now? And help others do the same. Our greater Cape May community needs to experience Christmas anew this year, and you can be a part of that experience. And what is that Gift ready to be opened this year? Jesus. Jesus is the Gift. The Gift that keeps on giving. It’s Jesus moving into our neighborhood, now. Today. Sure, he was born in the pastto Mary and Joseph among the animals in crowded Bethlehem. But it’s (also) todaythat God is with us. Today, God can blossom afresh into our lives. This week, all month, and as the new year unfolds, make time to talk with God. Pause long enough to listen, too. (Check out our online resources for your very own 30-Day Challenge.) Let God know you are grateful as you recall the best of your Christmas’ past, but that you want the Spirit to energize your life this Christmas! God wants to inspire your thoughts. (Pick up the Bible and take fifteen minutes to read Nehemiah, chapter 1 and Romans, chapter 12. Consider how Nehemiah responded to the cries of his community and how the Apostle Paul urged the house churches to renew their minds for action.) Once you open Christmas, God’s Gift, nothing remains the same. This Christmas, God can empower us to live our very best selves. Or, sure, we can remain stuck in Christmas’ past, repeating fine traditions but not learning or growing into God’s preferred future. Overhearing the Greatest Story Ever Told is O.K., but not letting the radical Good News transform our life is just a missed opportunity. God Is With Us, Emmanuel(Isaiah 7:14, 8:8; Matthew 1:23), as God’s emerging future unfolds with our every step. How exciting this Christmas could be! The first New Testament letter was sent to the house churches in the city of Thessalonica, in modern-day Turkey. Paul begins his letter thanking God for the way their lives were changing. He praised them for how they let the Good News shape their community. Each believer responded to God’s invitation to faithfulness in their own, unique way. It was all good. And different. Their “work of faith and labor of love and steadfastness of hope in our Lord Jesus Christ” empowered them to revolutionize their neighborhoods, improve people’s lives, and it elicited some of Paul’s strongest affirmations and expressions of gratitude. Cold Spring Presbyterian Church enjoys many wonderful traditions during Advent and Christmas that will provide a foundation for experiencing the presence of God in our lives today. Everyone is welcome to come and worship with us every Sunday in December. Enjoy special music, an interactive and inspiring message from God’s word, and a joyful community of faith! This year’s Advent Message Series is titled The All-Inclusive Storyfeaturing the animals of Christmas. Animals, you ask? Yes! The pastor, Jerome (347-420 AD), helped early believers learn the four gospels using familiar creatures, each representing Mark (the Lion, 12/2), Luke (the Ox, 12/9), John (the Eagle, 12/16), and Matthew (men and women, 12/23). Let’s open God’s Gift of Christmas together using these traditional illustrations. Melissa and I wish you a very merry Christmas. Remember: Once you open Christmas, God’s Gift, nothing remains the same.